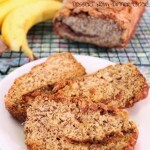 Favorite Banana Cake Recipe - Dessert Now, Dinner Later! 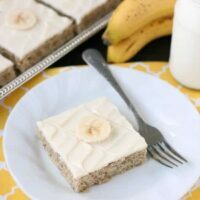 This is the BEST banana cake topped with the BEST cream cheese frosting! 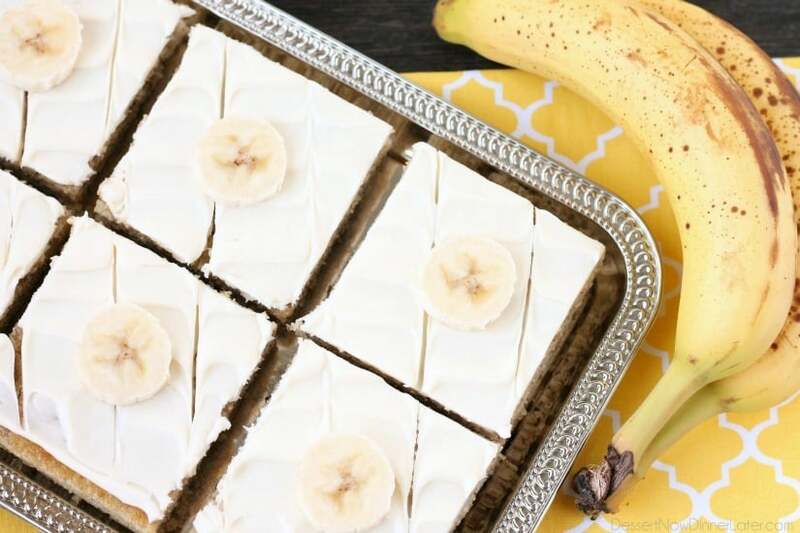 Perfect for picnics and potlucks, this banana sheet cake is a crowd pleaser! Everyone asks for the recipe! For some odd reason, we haven’t been eating our bananas lately. I just finished up my health challenge (I lost 11.8lbs in 6 weeks! Go me!) but I was eating mostly protein (chicken, turkey) and veggies (spinach, peppers, broccoli, green beans, carrots) and hardly any fruit, even though I love it. 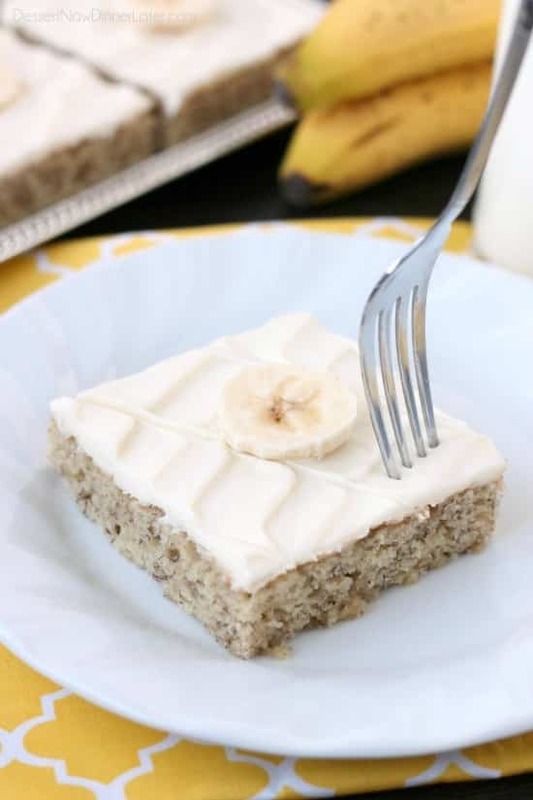 So apparently I was the only one in our house eating the bananas before I got all serious about losing weight, but all those bananas were frozen and are being put to good use in this cake! I first made this cake to take to some neighbors. We recently moved, and I’m still making friends. What better way to make friends than by bringing them cake? (I know!) My friends absolutely RAVED about this cake, so I made it again on my cheat day, so I could actually taste it. After I took a few bites, I thought, “This is way too good to not be on my blog!” so I grabbed a few pieces and photographed it, and here we are! I should say I have plans to make this cake again in the very near future, which would be the 3rd time in like 3 weeks. It’s that good! The reason why this cake is so good, is because it’s super moist. 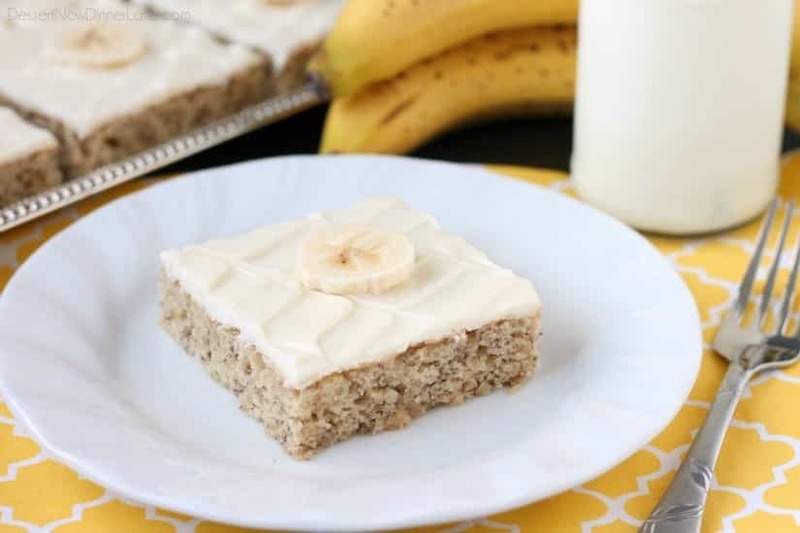 The bananas paired with some buttermilk (or curdled lemon milk – which is what I do) make it incredibly moist, and the ripeness of the bananas create a bursting banana flavor. The cream cheese frosting on top is none other than my tried and true recipe that’s gotten great reviews from many, many readers. It’s thick, soft, lightly sweet, and perfectly tangy. The BEST and only recipe I will ever use! This banana cake doesn’t have nuts in it, but I know a lot of people out there think it’s a sin to have banana anything without nuts in it, so go ahead and throw some walnuts or pecans in it if you like. 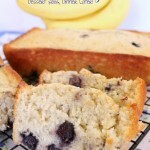 That won’t mess with the baking chemistry that makes this banana cake so perfect and delicious! I hope you love it as much as we do! 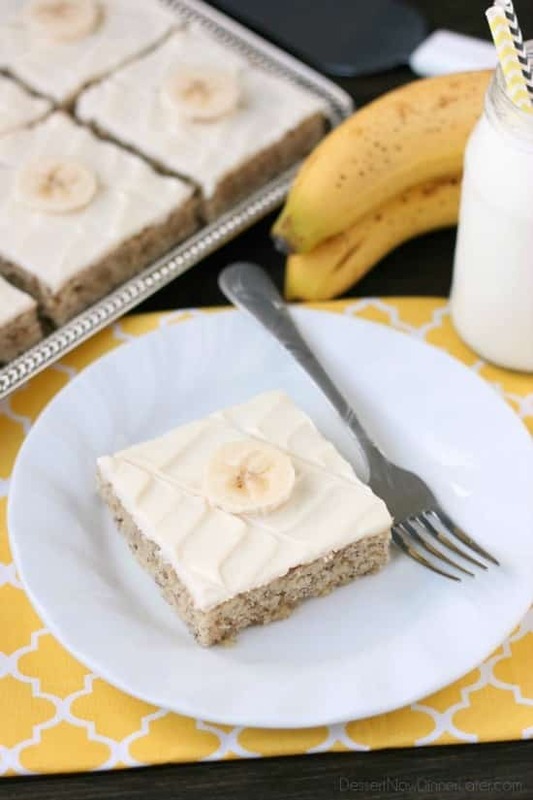 This is the BEST banana cake topped with the BEST cream cheese frosting! 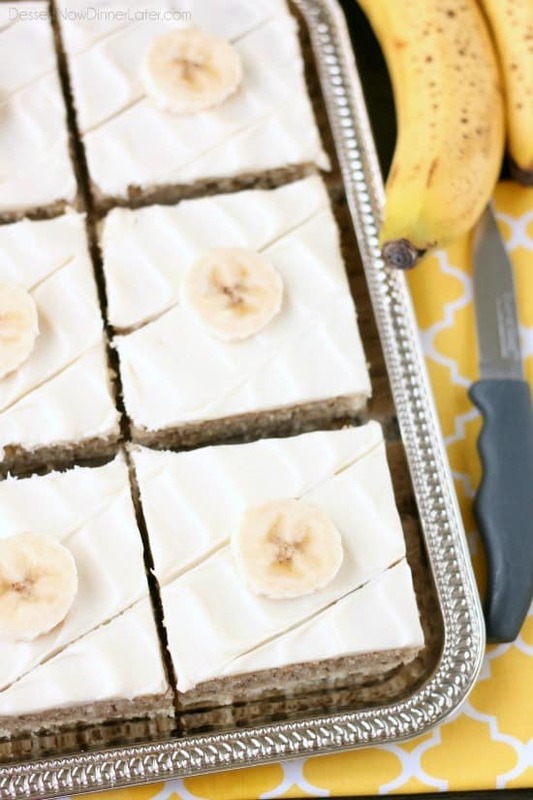 Perfect for picnics and potlucks, this banana sheet cake is our favorite recipe! In the bowl of a stand mixer with the paddle attachment (or using a bowl & electric hand mixer) cream the butter and sugar together. In a separate bowl, mix together the flour, baking soda, and salt. Add to the wet mixture while the machine is running. Add the milk mixture all at once and mix until just combined. Pour batter into a greased 13x18-inch baking sheet. Bake at 350 degrees Fahrenheit for 20 to 25 minutes, just until cake is done. Check with a toothpick or if cake bounces back when pressed lightly with your finger. Allow to cool completely. My favorite banana cake starts with buttermilk too and it is the cake I make more than any other by far! I’ll have to give this one a go next! Baked it today. it really is that moist. had no lemon juice so used vinegar in the milk. worked fine. delicious! YAY! So glad you liked it Susanne! Thanks for your review! If you’re talking about a 13×9-inch pan, you would only want to fill it 2/3 full (there may be leftover batter) and it would take longer to bake for sure. Maybe around 45 minutes to an hour. I can’t say for sure because I haven’t made it that way, but that’s my best guess. It will be more like banana bread, which takes a long time to bake. Let me know how it works out! Hey Amber, I just noticed someone stopping by from you blog to look at my banana cake and clicked back – thanks so much for the credit, by the way, but isn’t it just the best cake! I’m glad you loved it, glad you shared and glad MORE people are going to be able to try it! For sure! 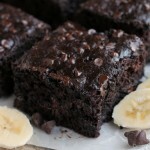 We love the recipe, my daughter asks to make it often, so thanks for sharing the goodness! What a wonderful cake. Very Banana-y with a nice fluffy texture. I will be making this often!! Glad to hear it! Thanks Melissa! Wondered if you meant to add baking powder…mine is rather flat and most of my recipes had that? This cake is thin, like dessert bars. 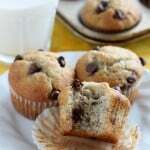 If you want a better rise you can certainly try baking powder instead.